Johannes Wilhelm Herman (called Wilhelm) was born on 18 Jul 1736 in Graefenstuhl, Saxe Prussia. He was the son of Johann Georg Herrmann and Anna Margaretha Guenther. Wilhelm married Maria Catherine Motz on 27 Dec 1757 in GERMANY. She was born 27 Dec 1734 in Hassen, GERMANY and was called Catherine. She was the daughter of Hans George Motz. Their first two children were born before leaving for America. In 1766, Wilhelm and his family came to America on the ship Pallidum, departing from Rotterdam, HOLLAND. On 18 Oct 1766 he swore the Oath of Allegiance in Philadelphia, PA, where he signed his name as Johann Wm. Herman. Wilhelm settled his family in Berks County, PA, where he eventually owned land in Heresford, Long Swamp and Ruscombe. The 1785 tax records show him as owning 100 acres of land, two cows, three horses and had eight family members. Wilhelm and Catherine had six children. The records in the office of the Adjutant General, War Department, Washington, D.C., show that William Herman served from 10 Jun 1777 to 16 Aug 1780 as a drummer in North's Company, Col William R. Lee's Regiment of the Continental Troops, Revolutionary War. According to family history, "two Herman brothers came from Pennsylvania and tied their horses so they could graze while the two men slept". North Carolina appealed to them so much that they decided to move their families here. Around 1786 William and his family moved from Pennsylvania to North Carolina where they settled in Lincoln County. The family was active in the Lyle Creek Community near Newton and Conover, North Carolina. 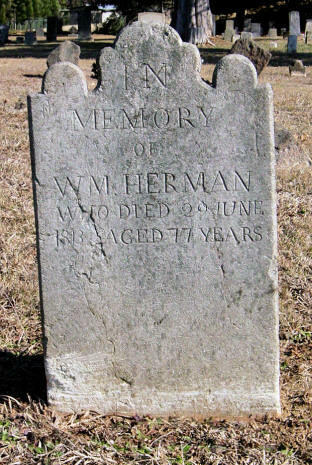 Wilhelm signed his will on 22 Jan 1813 in Lincoln County, North Carolina. 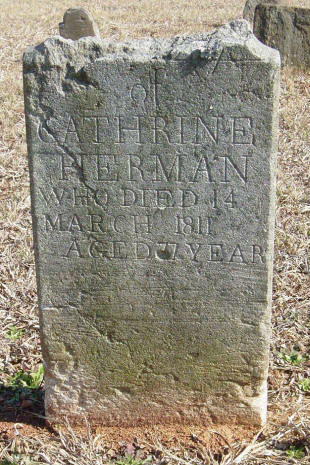 He died on 29 Jun 1813 in Lincoln/Catawba County, NC, and was buried in the Old St. Paul's Lutheran Church Cemetery, Newton, NC. William & Catherine's grave placement at Old St. Paul's Lutheran Church in Newton, North Carolina. 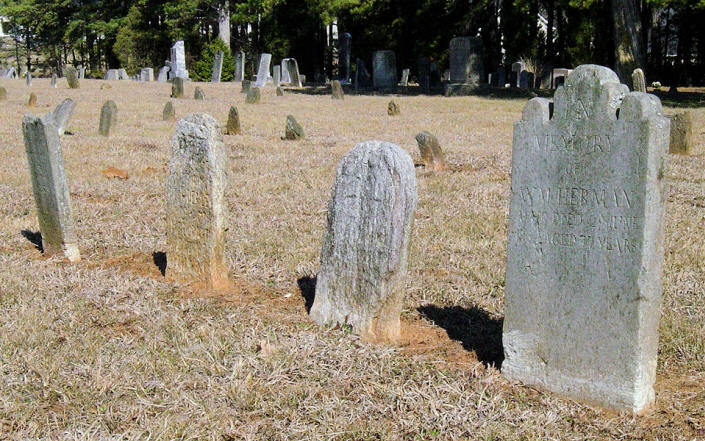 Catherine's headstone is on the on the extreme left, William's is on the right. Jim Herman has an excellent website with additional information on Johannes Wilhelm Herman. If you have photos or additional information on Johannes Wilhelm Herman or Mary Catherine Motz, please contact me.